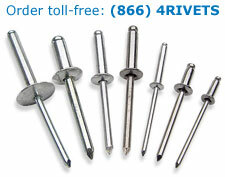 Open-end blind rivets provide an economical means for fastening metal parts where easy disassembly is not required. Large flange rivets are particularly suitable for fastening softer materials (wood or plastic, for example) to metal. The bodies of all our open-end blind rivets are fabricated by cold-heading, offering superior strength and excellent appearance. Our aluminum, aluminum-steel, stainless steel and steel open-end blind rivets meet IFI Specification 114.